I am writing a novel based on the life of Eadweard Muybridge. I am trying to find out which railroad Muybridge took in 1874 from Vallejo to Calistoga on his way to murder Major Harry Larkyns. Was it the California Pacific or the Napa Valley Pacific? (I've heard both) Also do you know what the locomotive and cars looked like at the time? Where they painted with black enamel? What markings, lettering, etc? Was the locomotive short and squat? How different was it from the locomotives used by the Central Pacific? Who owned the California/Napa Valley Pacific Railroad in 1874? Was it Samuel Brannan? Would there have been a first-class car and a "ladies only" car on the train Muybridge took? In 1874 the rail line from Vallejo to Calistoga was owned by the California Pacific Railroad, which in turn was controlled by the Central Pacific. The rail line was originally built in 1865 by the Napa Valley Railroad. This company was acquired by the California Pacific in 1869. The California Pacific was officially acquired by the Central Pacific in August 1871, but continued operating as a subsidiary company. I believe the Calistoga train was typically pulled by 4-4-0 #2 (3rd Cal P locomotive with that number according to most published rosters, although Cal P locomotives may actually not have been numbered in earlier years), named "Calistoga." This locomotive had originally been ordered by the Napa Valley RR in 1869, but was delivered to the California Pacific by the time it was completed. In the 1891 renumbering that combined all Central and Southern Pacific locomotives, this one became SP #1115. It is approximately the size of the Central Pacific locomotive Gov. Stanford (maybe slightly smaller) now on display at the California State Railroad Museum web site. This would be a little smaller than most of the Central Pacific locomotives, and also a little smaller than most of the California Pacific locomotives. Muybridge stereo #935 – Calistoga Springs – the Railroad, from Mt. Lincoln shows the train in the background. Behind the locomotive is an arch roof baggage-mail-express car, a smoking coach (probably Jackson & Sharp, with 4-wheel trucks), and two larger regular coaches (probably Ohio Falls, with 6-wheel trucks). The coaches were likely painted a straw or canary yellow or some similar color. The last two coaches were "first class," although I don't think either was "ladies only." The smoking coach was almost exclusively men. An article in the Sept. 2, 1874 Sacramento Union noted that locomotive Calistoga had just been rebuilt in the Central Pacific shops, and that it normally pulled the "brokers' train" between Calistoga and Vallejo. According to shop records, it was taken into the shops on Aug. 14, 1873, and turned out Aug 22, 1873. Note Vallejo was reached by ferry from San Francisco. I have forwarded this request to Norman Tutorow, who a few years ago pulled the coroners report, as well as the trial papers. Poor Larkin, while he was able to gaze on the naked form of Mrs. Muybridge (once in the company of the Muybridge housekeeper ((she walked in on the encounter)); she was the person that told old Muybridge that his bride was perhaps tilling anothers fields) was shot dead by Muybridge in Calistoga. As I recall, as Muybridge pulled the trigger, he hollered something to the effect "This is for my wife!" A trial was held, and Muybridge, while he admitted pulling the trigger, was found "not guilty." Norman will have the answer, I am certain. The railroad in question was, by 1874, the California Pacific Railroad, having acquired by long term lease the former Napa Valley Rail Road. The "Cal P" was a larger line, with its main stem operating between the San Francisco ferry landing at Vallejo Point eastward through Davisville (today's Davis) to Sacramento and north from Davisville to Knight's Landing. The acquisition of the Napa Valley Railroad by the California Pacific gave it good passenger and solid seasonal freight traffic between Vallejo Junction to Napa (Napa City) and Calistoga. The history of the Napa Valley Rail Road is a bit more convoluted and not entirely relevant to your tale. However, in 1874 it is important to note that the controlling interest in the California Pacific had been ceded by the Cal P's principal investors, D.S. Haskins and Peter Donahue (among others) to the Central Pacific Railroad, which held the Cal-P under another long term lease. So, technically, the big wigs behind the Cal-P were none other than the infamous "Big Four" including C.P. Huntington and Muybridge's benefactor, Leland Stanford, Sr. The Big Four had already altered form in that one of the original quartette, Mark Hopkins, was already deceased in 1874. However, both Charles Crocker and his brother, Judge E.B. Crocker, were active in the Central Pacific directorate. That said, the California Pacific was still operating much as it had been before the Central Pacific acquired control, which means largely with its own locomotives and rolling stock. Yes, there were "First Class" coaches operating between Vallejo, Napa and Calistoga in addition to more generic, simply furnished "day coaches." If unescorted ladies wished to travel in relative security they could have purchased a seat in the First class coach. But plenty, I trust, travelled (escorted or not) in the plainer day coaches. There would also have been, at the head-end of the average daily passenger train, a baggage-express-mail car coupled immediately behind the Cal-P steam locomotive. California Pacific locomotives, all wood-burners, were mostly classic, Eastern US locomotives, mostly then-recently delivered from the Mason Locomotive Works of Taunton, Massachusetts. They were beautifully ornamented, not black and were more likely painted in wine and crimson red trimmed in black, green (emerald and deeper greens) and pure gold gilt stripes and ornamentation. All were named for either on-line location names or key figures in the original California Pacific. The two standout engines were the "D.S. Haskins," the "Calistoga" and the "Napa." Without doubt, Central Pacific Railroad locomotives made their appearance in service anywhere on the Cal-P, but mentioning that might be unnecessary. Photographs of some of these can be found in the collections of the California State Railroad Museum Library in Sacramento. The coaches' colors are really an unknown. There is no concrete mention of their colors in regional or Napa Valley newspapers around this same time. When the First Class coaches were received from their builder's works (Wason) back East, there was a bit of news praising their creature comforts, but nothing very illustrative. They were pretty much average cars of the 1870s, with clerestory roofs that fetured small rectangular glass windows and air vents along the sides of the clerestories. The exteriors of the cars were most probably painted some form of the extremely popular (nationally speaking) light straw or buttercup yellow capped off in gleaming varnish. Inside, passengers would have ridden on deep red or green mohair-upholstered seats, the backs of which could be flipped to permit passengers to face each other or to allow the cars to change direction at any terminal without the car being physically turned around: the conductor or brakemen would just flip all the seat backs and go the opposite direction. Each car, whether a day coach or first class type, would have had at least one "saloon" – the average and popular term for the water closet. There was rarely any water therein – only a dry hopper with wood seat and maybe a corner urinal made from tin, the waste dropping direct, unflushed, to the tracks below. There was not likely any sink or lavatory. Outside the saloon was likely a round, painted tin drinking water dispenser resting on a wooden shelf in the corner against the closest car-side window and in lieu of a seat. Here passengers could take sips of water from a common-use tin cup on a chain. Folding disposable paper cups in dispensers would not make their appearance for at least another one or two decades! Each coach was heated by a single cast iron wood or coal-fueled stove cylindrical in shape. Fresh air came only from the clerestory vents and unscreened passenger windows next to each seat which raised anywhere between a four to about fifteen inches and were held in place by cast brass (often nickel plated) catches on one side of each window sash. California Pacific Railroad was a fairly modern railroad and its passenger engines and passenger cars were equipped with Westinghouse air brakes which provided slowing and stopping on the main line. When cars were being switched or uncoupled, however, manual hand brakes were used on each coach (and most freight cars), the brake wheels being on vertical iron staffs at both end platforms (with steps allowing passengers to safely alight or board). Freight cars had a vertical brake wheel near the top of the roof at only one end. When a passenger train was to be stopped or started, the conductor – always in charge of the train (not the engineer) communicated with the engineer by means of a signal gong cord strung along the coaches' ceilings which was clipped to a brass signal gong permanently mounted on the engine's cab interior ceiling. Two claps on the gong said "start" and one clap usually meant "stop" at next station. A rapid series of gong claps said "emergency stop." In that era a passenger train could stop with an emergency air brake application in about a half mile's distance or slightly less if train speed was not much greater than 30 - 40 m.p.h. The bottom line: for any passenger, including Muybridge, to reach any point on the Cal-P from Vallejo north or eastward, he/she would have had to take a California Pacific steam ferry boat from the foot of Market Street in San Francisco to Vallejo Point, where the connecting train was waiting on the adjoining ferry pier or slip. Trips to San Francisco ran the same way, with all passenger trains meeting scheduled ferries at Vallejo Point. The California Pacific prided itself on punctual train and ferry services. Historic photographs (and perhaps some train+ferry specimen timetables) of these same Cal-P ferries can be found both at California State Railroad Museum Library, Sacramento and the J. Porter Shaw Library/National Maritime Museum in San Francisco. I, for one, look forward to seeing your book in print; the life story of Edweard Muybridge is a fascinating one indeed, even short of his attack on Harry Larkyns. I trust you will frame that particular episode not just from a posture of jealous rage but also from the forensic point of mercury and other photographic elementary poisons that probably drove Muybridge to a certain level of insane madness. Therefore, as Kyle noted before, in 1874 the "Calistoga" was in its CP shops paint scheme of a deep reddish brown, with red wheels. Two parallel gold and red stripes went along the top and bottom of the tender sides and back, and the gold letters "Cal." and "P" flanked the engines number, which was also in gold. Its entirely possible the headlight had landscapes painted on the sides of the box-shaped housing. This was a common feature of CP system engines in the 1870s. Typically these were idealized scenes of mountain lakes or valleys. Notes on Jim Wilke's comments. It is actually not clear that the Central Pacific shops repainted the locomotive Calistoga in standard Central Pacific colors in 1874. (Jim accurately describes the standard paint scheme.) We have two very clear (outstanding, in fact) photos believed to have been taken by Muybridge showing the locomotive. They do not show the locomotive in standard Central Pacific shops paint style, but rather in the style I described earlier. It is certainly possible that the photos predate the 1874 shopping. On the other hand, the locomotive may not have needed repainting. The shop entry makes no mention of repainting – and there are repainting mentions in other entries. On coach colors, as Kevin notes, there is little concrete information on colors. However, one photo of the locomotive also shows the baggage car. The gray tonal range and lettering in the black and white photo is consistent with a yellow car. In the distant Muybridge stereo #935 view (too distant for much color information), the baggage car has an arch roof (as it does in the other photo), while the smoking car and the two first class coaches have clerestory roofs. We know the first class Ohio Falls coaches had duckbill ends. Some Jackson & Sharp cars had monitor ends. Also, the California Pacific built some of its own 2nd class cars with duckbill clerestory roofs. I agree that red or green plush covered seats were typical. In the 1870s the seat backs typically had a lock, so only the conductor could flip them to the other direction. If requested, the conductor would usually flip a seat back over for a passenger. The higher class finish for fixtures such as lamps and window hardware was nickel plate, and this was probably used on the first class Cal P coaches. Brass finish was considered the cheap finish. The smoker may or may not have had brass finished fixtures, depending on whether it was built as a second class coach or if it was an old first class coach now downgraded. The baggage car almost certainly had brass fixtures, not nickel plated. Thank you so much for your extremely prompt and wonderfully informative e-mail. That's exactly the information I was looking for! Thank you also for passing my original e-mail on to your colleagues Kevin Bunker and Mark French and Chris Graves who also sent me lots of fascinating information. Since you were all so kind I am taking the liberty of sending you a few more questions. Please ignore them if you're too busy. I am also copying this e-mail - along with my sincere thanks for their help - to Kevin, Mark and Chris. As Chris suggested, I will telephone Norman Tutorow with questions and an inquiry about the the coroner's report and copies of the trial papers he has which I have been looking for on and off for some time. 1. Muybridge took stereo views of Central Pacific trains in the Sierras. What would the interior of a train station near Lake Flora that he might have entered have looked like? 2. What personnel might have been working at such a station? Telegraph operator, secretary to write down his Morse code translation? Railroad operatives? Station Master? Porters? 3. Who owned such stations? Central Pacific or Western Union? 4. Do you know any of the details of Stanford's "Silver Palace" Pullman Delmonico dining car that I believe was sometimes parked in the Sacramento Railroad Station in the early 1870s? 5. Do you have any details about the Sacramento to San Francisco steamboat the Chrysopolis circa 1874? Furniture, fittings, food, drink, engine, etc.? 6. What types of private horse-drawn carriages would have waited for affluent theatergoers outside the California Theater circa 1873/4? Broughams, berlins, clarences, victories, phaetons, landaus, barouches, cabriolots? Private carriages used during the evening hours were enclosed, rather than open, so broughams, with an occasional private coach or two, would be the correct vehicles. Phaetons, victorias (note the correct spelling) and the rest are open vehicles appropriate to park driving and summer use. Candle lamps with some oil lamps were employed; candles were more common. The steamer Chrysopolis – Greek for "Golden City," meaning San Francisco - was powered by a walking beam engine which can be seen in photographs of the vessel. Cylinders were mounted vertically, transmitting power through the beam to rods connected to the wheel axles. In motion the beam would rock back and forth. The passenger spaces of Chrysopolis centered on a large saloon, or public space, surrounded by cabins. Large steamers of the best class typically employed a single large saloon for both ladies and gentlemen with a private ladies' saloon to the stern of the vessel, where it was most protected from danger of boiler explosions. Gentlemen were forbidden from these areas unless invited; some vessels had a smoking saloon, but I am not sure if this one did. 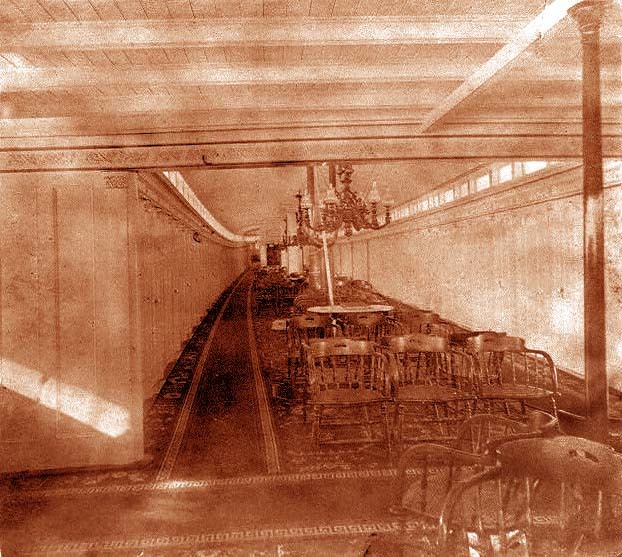 The saloon was usually painted white, with gothic panels, scrollwork frets and other work highlighted with gilt trimmings, and lit by a clerestory through the deck above, sometimes with colored glass, which gave a jewel like effect. Carpeting was sometimes Brussels, or an imitation, with rich colors and small figured patterns. A long table or series of tables extended down the center of the room upon which meals were served, often of several courses, Fine food was a competitive edge employed by steamboats, but whether this employed by this vessel's owners given their monopoly is not known to me. Further reading on food, passage and so on can be found in "Steamboats of the Western Rivers," and the topics of food, interiors, etc. are largely applicable to the Sacramento River boats as well as the western boats it focuses on. Stanford did not use a Pullman car, as the Central Pacific's Silver Palace cars were privately operated by the railroad. Pullman service existed briefly in 1869-70, but after that the contract was cancelled. Kyle's note that the engine Calistoga was not repainted in the CP shops is very helpful, but the engine would most likely be due for repainting after four years of service. How much it retained its original appearance would be due to a variety of factors, such as influence of CP standards upon the Cal P, which varied throughout the system. I doubt very much that the engine would have retained its name, for example, as named were dropped from all CP system engines (save for a handful outside of this topic) by 1874. In 1871 the California Pacific repainted engines with vivid and original colors, including one with emerald green driving wheels and a tender painted emerald green and wine color. In contrast, the new engines "London" and "Frankfort" may have been delivered from the Mason Machine Works in an equally stylish drop black. I'll answer a few quickies. 4. This conflates three different types of cars. The Pullman Palace Car Company owned and operated the Pullman dining car Delmonico. In late 1869-early 1870 Pullman trains operated on the Central Pacific, but the arrangement was terminated. A few dining cars came out with Pullman sleepers and hotel cars during this period. Instead of Pullman sleeping cars, the Central Pacific operated their own Silver Palace sleeping cars. In the 1870s Stanford did not have a personal private car, to my knowledge. Instead he used the Central Pacific Director's Car, which may have been parked at Sacramento when not in use (although there were not too many spare tracks around the Sacramento depot in the 1870s). There are interior photos of the Silver Palace cars, and also of the Pullman cars of the period. 5. Lawrence & Houseworth, later Thomas Houseworth, published some stereo interior views of river steamers in the mid 1860s. Note view 1207, attached. I think this is on the steamer Capitol. 7. Passenger car lighting was in transition in the early 1870s. The Central Pacific coaches and Silver Palace cars used candle lamps when built in 1869. These show in the early photos. they look much like the later oil lamps, except there is a long stem at the bottom to hold the candle and spring. By the 1870s these may have been in the process of being replaced with oil lamps, but I have no specific information on this. Locomotives and coaches were highly varnished in the 1870s. It was common for them to be cleaned, paint touched up as needed, and revarnished a number of times. Under these conditions original paint could last for a long time. Since the Calistoga operated mostly in the Napa Valley were the climate was mild, its original paint could have remained very serviceable (with touch-ups and regular revarnishing) for a good many years. We certainly found evidence of this kind of practice on the many Nevada pieces we restored for the California State Railroad Museum in the 1970s (and these operated under rather harsher conditions). The original paint was covered with a thick layer of varnish, representing many revarnishings. By the late 1870s and 1880s practices were changing – revarnishings become less frequent, and repaintings more common. That said, I return to my original statement. We don't know whether or not the Calistoga was repainted in the 1874 shopping (or before). If/when it was repainted, I would expect it to follow Central Pacific standards. We do not know the date of the two photos of the Calistoga that we have, nor do we know the photographer, although we suspect Muybridge. In the photos the paint scheme is very bright and clean - obviously well cared for. The paint style generally appears to be in a style that we know the Union Iron Works used on new locomotives, suggesting it is as it came from the factory. It could be an 1869-70 photo showing the locomotive as new, or it could be later showing it well maintained. 1874 is really in the middle of a transition period. Equipment was being repainted in the new standard paint scheme, but many locomotives remained in old paint. An example is a photo of Central Pacific locomotive 149 taken at Wadsworth, Nevada, in late 1875 or early 1876. The locomotive has been repainted in the new style, but the tender retains its factory paint, except that the tender had been lengthened and the Central Pacific had infilled in the original style (leaving the number off-center on the side of the tender). This locomotive was in first class passenger service across Nevada at the time. Not long after the above mentioned photo the tender was also repainted in the standard scheme. The repainting was no doubt precipitated by the selection of this locomotive to pull the record-setting Jarrett & Palmer Transcontinental Express on the Central Pacific in the summer of 1876. Photos of the locomotive and tender after that run show it fully painted in the new standard scheme - and note this was 1876. The new scheme was adopted earlier - locomotives built new in the CP Shops in 1873 and 1874 were painted in the new scheme – but clearly the railroad only painted those locomotives that need it. ... Muybridge was active in the Bay Area. I have two related stereos of the gallery at Woodwards Gardens in San Francico, one of the stereos features Muybridge sitting on a sofa. Thank you very much for this. The scene in my novel involving carriages takes place in February 1973 and it looks as if it's going to rain any minute, so people in the coaches could be bundled up with blankets and rugs even in open carriages with the hoods folded up? Or does this situation mean that all "park driving/summer use" conveyances would be out of the question? Are we only left with broughams and private coaches? (I've read that there were enclosed versions of clarences, barouches, landaus, berlins, post chaises, calashes, hansoms, diligences, coupes? Or were there hoods just folded up? But perhaps there weren't any of these around in California in the 1870s anyway?) If so, were there names for different types of private coaches? I'm looking for a list of "exotic" (to us) names that convey the idea that the luxury conveyances of the very rich at the time would have been the equivalent of a line up of today's Mercedes, Porsches, Bentleys, Rolls Royces etc outside an expensive theater or restaurant.